An author of medical thrillers, and one of the original members of the International Thriller Writers Association, Dr. Nelson Erlick has a wide range of experience in medical/surgical specialty practice and in analyzing some of the most controversial and complicated medical technologies of our time. A retired Board Certified Podiatric Surgeon and award winning researcher, Dr. Erlick, holds a Doctor of Podiatric Medicine (DPM) from the Pennsylvania College of Podiatric Medicine, an MS in Biology from Drexel University, and a BA in Biochemistry and Natural Science from the University of Pennsylvania. He has twice won the top award in podiatry (William Stickel Gold Medal) for original research on topics in wound healing and diabetes, respectively, as well as the top research award for podiatric residents (O'Neal Jones and Feldman) for developing a new skeletal radiographic measurement technique. Following eleven years of private practice, Dr. Erlick served as the Senior Health Technology Analyst at ECRI, an internationally renowned medical technology "think tank", where he researched, analyzed, and wrote comprehensive, precedent-setting assessments on controversial topics including: high-dose chemotherapy with bone marrow transplants for the treatment of breast cancer, ovarian cancer, and lung cancers, as well as innovative developments in biotechnology, laser therapy, electrical stimulation for wound healing, and pain management. In particular, one of his assessments demonstrated that regimens using high-dose chemotherapy with bone marrow (or blood cell) transplantation for women with breast cancer were ineffective--five years before the oncology community came to the same conclusion. Agencies of the U.S. government, including the Health Care Finance Administration (Medicare), various state regulatory agencies, and major health insurers have used Dr. Erlick's assessment reports to determine whether medical innovations are safe and effective for the public. Subsequently, Dr. Erlick worked in the pharmaceutical industry, first as a Senior Clinical Writer, responsible for interpreting and writing key clinical and statistical documents for submission of new products, including antibiotics, to the Food and Drug Administration, and then as a Manager of Medical Information and Technical Writing where he participated in the design of clinical studies for pain management. Currently, he serves as Medical Director at a renowned medical communications firm in the Philadelphia area, where he writes articles and designs meta-analyses on critical studies centering on emerging agents for the treatment of cancer. 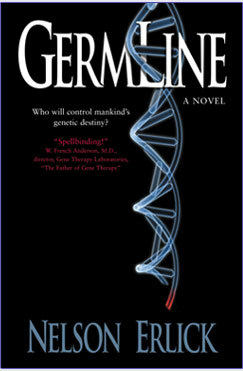 His first novel, the critically-acclaimed medical thriller GermLine (Forge 2003), received praise from leaders in the scientific community (including W. French Anderson, MD, the "Father of Gene Therapy", and J. Craig Venter, PhD, President of the Center for the Advancement of Genomics), literary critics (including Kirkus Reviews, Library Journal, The Philadelphia Inquirer), and noted novelists (Douglas Preston, Greg Cox). 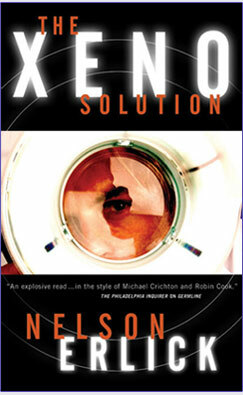 The Xeno Solution (Forge, October 2005) is Dr. Erlick's second novel and has received advanced praise from renowned novelists including Michael Palmer, John Lescroart, and David Dun. Read the Backstory of "The Xeno Solution"